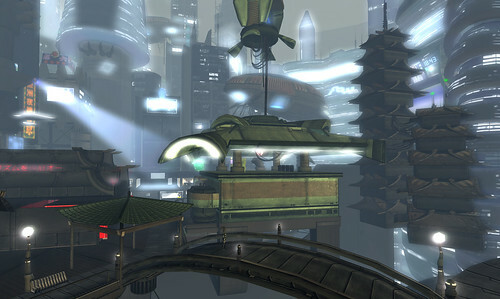 Images of the beautiful sky city INSILICO in Second Life, where we were in class today. Sadly it took a very long time to rez, so hopefully these on my Flickr will make up for what we couldn’t properly see while we were there. More images of Insilico can also be found in the INSILICO Flickr pool. The blog post I wrote for INSILICO on the NPIRL blog is here. This is an installation which I created in Second Life for an invitational exhibition at a very beautiful new island called Poetik Velvets owned by Nur Moo and designed by Hern Worsley. The full text of my piece is here. And do check out vimeo for video uploads. It is absolutely wonderful. Not at all that youtube type of shoddy pixels stuff, this place emphasizes HD, which you can create by uploading 1280 pixels wide video which they crunch into HD. 59.99$ gets you a pro account with 5 Gigs of uploads per week, at which point the HD feature would really come into its own I suppose. What I have (only for now, I might add!) is a regular account which only allows 500MB’s per week, so what I have embedded into here obviously isn’t HD.